Boutique lodging at the eight room hotel near the shores of Flathead Lake. 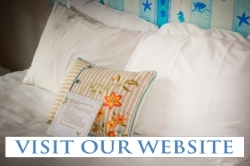 All the rooms at The Islander Inn are influenced by the tranquil elements of our favorite islands! The Islander Inn is located in an ideal spot; perfect for exploring and enjoying all that Northwest Montana has to offer. We are located on the shores of Flathead Lake and surrounded by cherry orchards, flying osprey and eagles and breath-taking sunsets. Whatever the season is, We are located just across the road from the wildly popular restaurant and bar right across the street, The Raven!